8 Circuit SSG Bedini Monopole Circuit board. Home > Electronic Parts > 8 Circuit Circuit board. Comes without the parts on the board. The circuit board has the potential for 8 circuits with neon bulbs holes, diode holes, and several other features. The board was made as small as possible given the parts used and heat sinking. 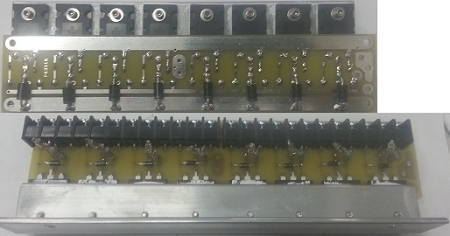 The transistors are mounted upside down so that their backing faces away from the board onto an aluminum sink.